The City takes a big step this week in its commitment to increase energy efficiency and reduce San Rafael’s overall carbon footprint with the replacement of more than 2,700 street light bulbs with LED lights. The LED (light-emitting diode) lights, use dramatically less energy than standard older, high pressure sodium lights, and are estimated to save the City $130,000 in energy costs annually. The new LED fixtures also have a longer lifespan, and have proved to require little maintenance compared with the current fixtures. Taken as a whole – including the other upgrades planned for interior and exterior lighting in City buildings – the project will save 1,012,110 kilowatt hours of electricity per year: the equivalent of the electricity needed to power 105 homes or 150 cars each year. “This is good for the planet, good for our budget and it helps us meet our sustainability goals,” City Manager Jim Schutz commented in a Marin IJ article about the project in September. There are two types of LED lights that will be installed. 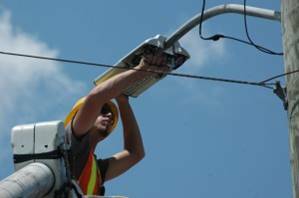 Street lights on residential streets will be outfitted with a warm yellow LED. Busier “arterial” roads (streets such as Second Street, Third Street, and Andersen Drive) will have slightly brighter neutral lights, recommended to improve visibility at night. Crews will begin the work this week in the Northeastern part of San Rafael and work their way down to the Southeastern corner of the City in a grid pattern (see attachment). All replacements are expected to be completed by mid-January. Since this is a fast-moving process, no parking will be restricted and replacements on busy streets will take place during non-commute hours in order to minimize any traffic impacts. The $1.7m project is financed through a California Energy Commission 1% interest loan intended to assist City’s with funding energy savings projects. The loan will be paid with the energy savings realized from the project, resulting in zero long term cost for the City. It is estimated that the entire loan will be paid off in seven years; after which time the City will enjoy the annual savings of $175,000 on an ongoing basis. The work is being managed by PG&E through their Sustainable Turnkey Program.